The Population Bomb. [San Francisco]: The Sierra Club, 1969. "Too many cars, too many factories, too much detergent, too much pesticide, multiplying contrails, inadequate sewage treatment plants, too little water, too much carbon dioxide- all can be traced easily to too many people." 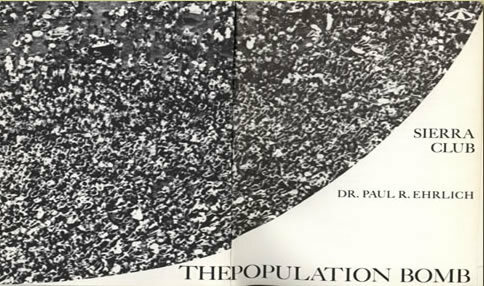 Identifying overpopulation as one of the main sources of numerous environmental problems, Ehrlich's book, selling over three million copies, continued a global debate over sustaining the growing human population. 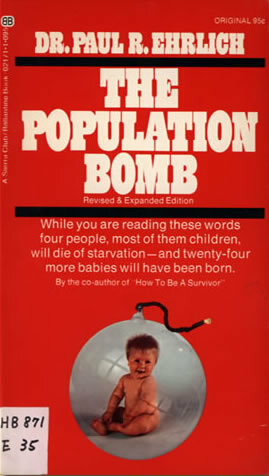 Although some of his predictions never came to pass, he and his wife Anne continue to write about problems related to overpopulation in works such as their The Population Explosion (1990).